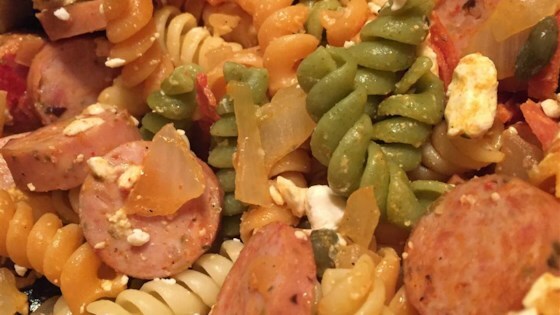 "A pepperoni, olive, mushroom and caper sauce tops a pound of your favorite pasta. An eccelectic mix of ingredients that combine to make a quick and satisfying pasta dish." In a large skillet heat the olive oil over medium high heat. Add the garlic and onion and saute until translucent. Add the tomato, olives, pepperoni, mushrooms, capers and salt and pepper to taste and simmer until heated through. Meanwhile, bring a large pot of lightly salted water to a boil. Add pasta and cook for 8 to 10 minutes or until al dente; drain. Add warm sauce to pasta and sprinkle with mozzarella cheese; mix well and serve immediately. Watch how to make this top-rated recipe. I liked using pepperoni & the kalamata olives but this really needed a sauce of some kind. used white wine but that didn't help. Also used spaghetti noodles which I would not recommend. This was O.K. as directed but would probably forgo the capers next time, or at least use less. Thanks for sharing. I substituted Italian Sausage for the peperoni, it was fantastic. i love this recipe! it's easy, fast, and delicious! Wow! This pasta packs a punch. I have made this dish several times and keep coming back for more. It is also great on rice, on a cut of meat, or as a topping for crusty bread. Fabulous!